TEL AVIV – Top tier news outlets including CNN, the BBC, and the Independent covered the deadly Palestinian terror attack in Tel Aviv in questionable ways. Four people were killed and at least sixteen others wounded when two Palestinian gunmen opened fire at two separate locations in Tel Aviv’s outdoor Sarona market. 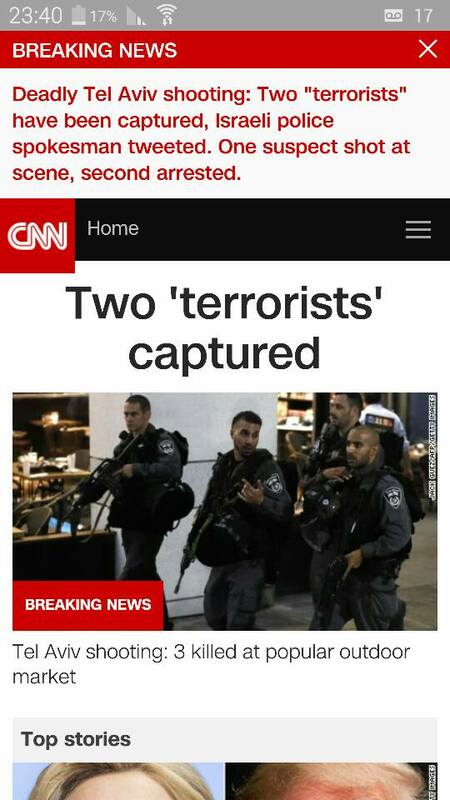 CNN initially ran the headline “Two ‘terrorists’ captured.” The use of quotation marks around the word “terrorist” suggests that the definition of the two Palestinians who opened fire on civilian is a matter of debate. 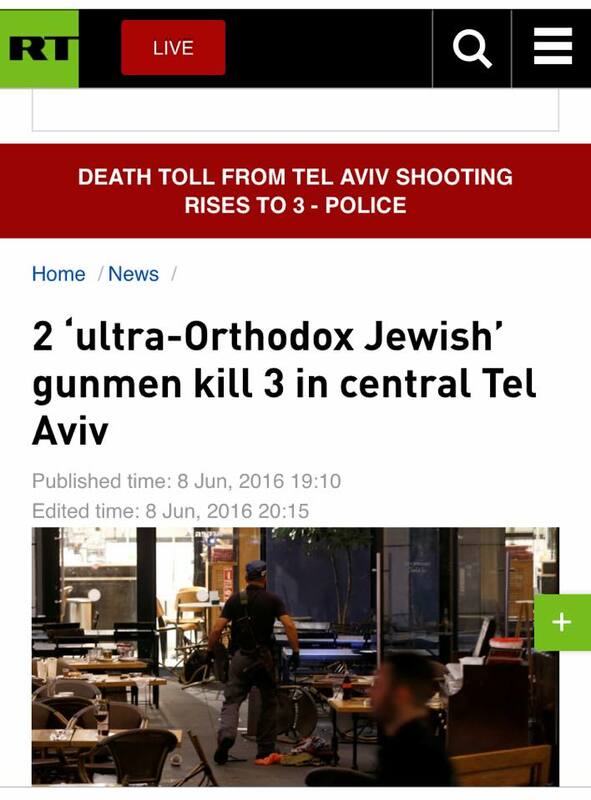 The news site has since updated the headline to read “Tel Aviv shooting: Four killed in shopping centre attack,” again making no mention of the terrorists. Sky News also had problems determining Palestinian culpability – not just with this attack but with all attacks since the start of the terror wave, stating: “Since October, 31 Israelis and two Americans have been killed by attacks allegedly [Ed: emphasis added] carried out by Palestinians.” Not to mention that the toll is also inaccurate. 33 Israelis and four people of other nationalities have been killed since October. Both the BBC and the Daily Telegraph stressed that the attack happened near the Israeli defense ministry and IDF headquarters. 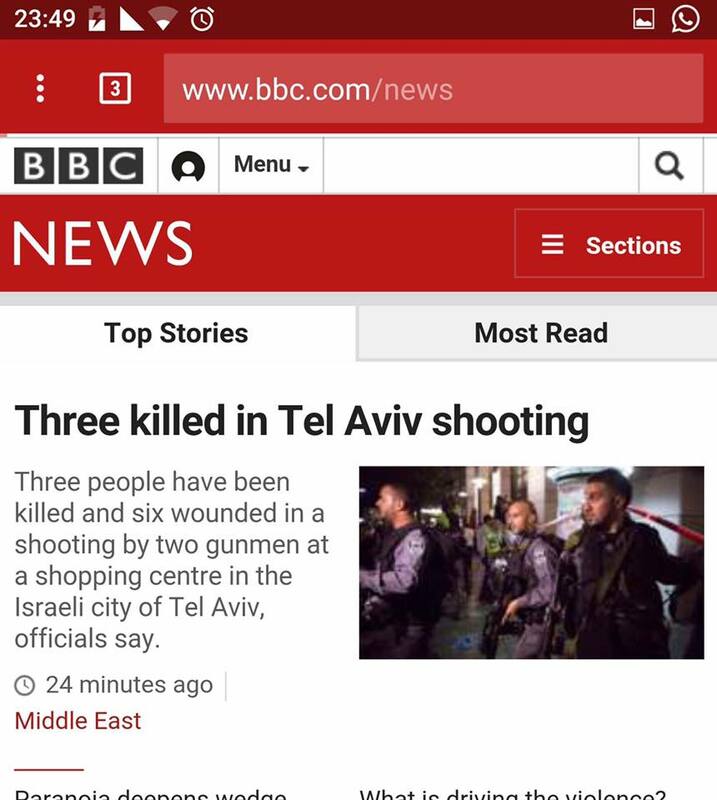 The Telegraph’s headline said: “Three people killed in Tel Aviv shooting near Israeli defense ministry,” seemingly implying the carnage is linked to military and not civilian targets. Meanwhile, the Independent referred to Tel Aviv as Israel’s capital in the headline to its story. Media watchdog HonestReporting.com swiftly informed the outlet that Jerusalem is the capital of Israel and the headline was subsequently amended. Perhaps the headline that took the cake was courtesy of anti-Israel Russian outlet RT that stated: “2 ‘ultra-Orthodox Jewish’ gunmen kill one, injure 8 in Tel Aviv.” The mention of ultra-Orthodox Jews was apparently in reference to initial reports that one of the terrorists may have been dressed as one. Nevertheless, anyone taking a cursory glance at the headline would have to be clairvoyant to understand that. RT later amended the headline.